We strive to inspire through creativity, quality design and corporate branding. 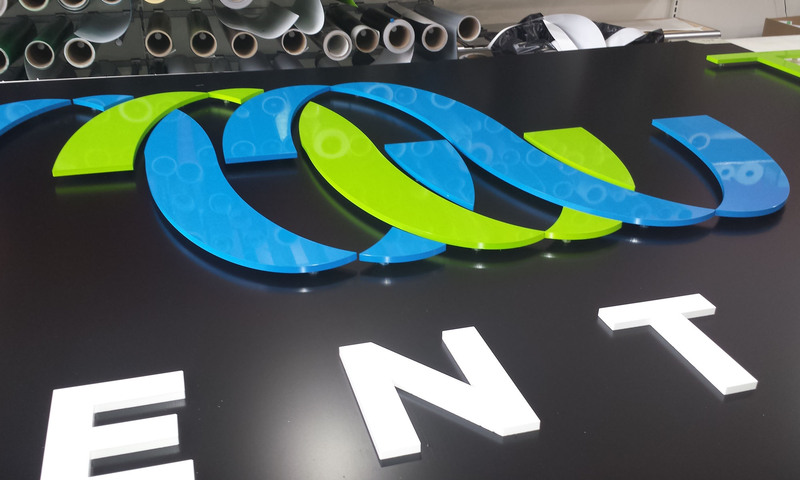 Whether you want privacy glass, wall coverings, a reception sign or general office wayfinding signs. We will point you in the right direction and deliver you the best quality products and service. Wall signage is something that eventually every company shops around for. You will need a logo sign in your reception area, restroom signs, name plates, wall decals and maybe even LED illuminated letters. Sign Studio will help you decide your limitations and needs based on your budget. Window graphics can set the mood in your office rather quickly. From open concept frosted etched inlays with partial privacy, to perforated view through window film with digitally printed designs. You can’t go wrong adding signage to your windows. They fill the environment with colour, design and inspiration. Wayfinding signs are a Sign Studio specialty. Clear or frosted stand-off signs with second surface cut vinyl directional arrows, custom illuminated directory signs and more. Whether you have a tight budget or some flexibility for creativity, we have solutions that will dress up your shopping center, lobby or business complex and keep you looking professional. Wrap vinyl is not just for vehicles. We use high quality 3M 1080 series and printable ij180cv3 vinyl which are, hands down, the best products available. Wrap vinyl sticks well to smooth glossy surfaces including powder coated steel, anodized aluminium, semi gloss painted wood, glass, acrylic and more. We will wrap almost any object you can think of inside or out of the office.